Developing a thorough understanding of criminalisation and related phenomena by compiling and systematising good practice (e.g. counterstrategies) to fight and prevent this threat. How community-based defenders operating in remote rural areas organise themselves and act collectively to defend their civil and political rights, as well as economic social and cultural rights – including the defence of their ancestral territories. The effectiveness of national public policies for the protection of defenders. The impact criminalisation and the shrinking of spaces have on HRDs and civil society organisations, and the strategies that can be developed to counter such campaigns aimed at silencing the social struggles. Fostering experience sharing (internally and externally) of protection network methodology of community-based defenders operating in remote rural areas organise themselves and act collectively to defend their civil and political rights, as well as economic social and cultural rights – including the defence of their ancestral territories. Our Policy, Research and Training Unit based in Brussels and with the support of the team of senior advisors and protection desks, captures these practices, and turn our research findings into protection manuals, defenders tools, policy makers tools, our online training, and other formats that make the lessons learned available to interested parties. Develop a thorough understanding of the situations and contexts where HRDs and CSOs are at risk. 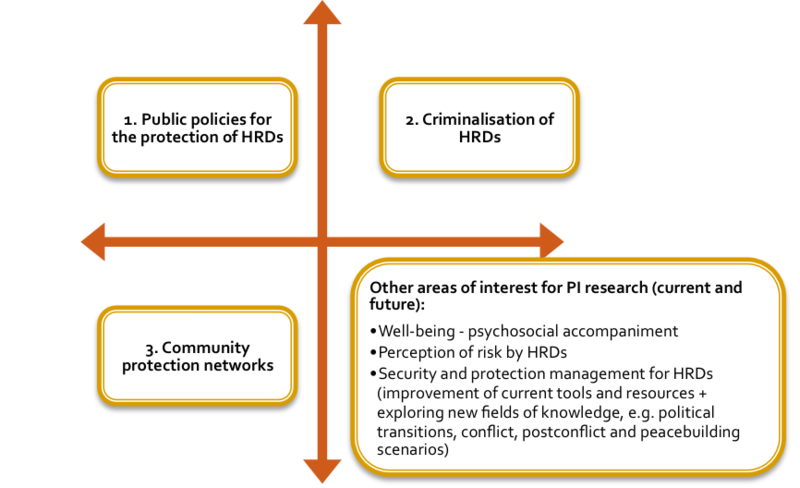 Produce research outcomes that adequately inform the practice and protection of HRDs.